Purpose: The CCCC James Berlin Memorial Outstanding Dissertation Award Committee honors a graduate whose dissertation improves the educational process in composition studies, or adds to the field’s body of knowledge, through research or scholarly inquiry. 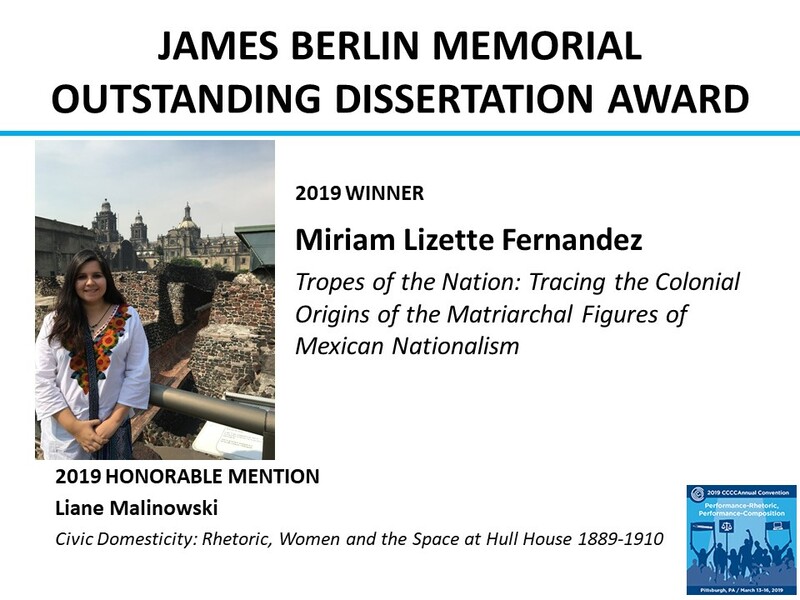 Eligibility: To be eligible for the 2020 Berlin Dissertation Award, the dissertation must have been accepted by the degree-granting institution, and the writer of the dissertation must have received the degree between September 1, 2018, and August 31, 2019. Award Specifics: Applicants must submit to CCCC the following items: (1) title page; (2) abstract; (3) summary of the dissertation (maximum length 10 pages; summary must be in manuscript form); (4) a of the dissertation (please include items 1-3 as one attachment and the full dissertation as a separate attachment to your submission email). Submissions must be received by September 1, 2019. Send submissions to the following address: CCCC James Berlin Memorial Outstanding Dissertation Award Committee, cccc@ncte.org.